With the recent news of the Maersk Kampala, a vessel near the Suez Canal dealing with a prolific container fire, some shippers might be concerned about the possibility of their container setting on fire. 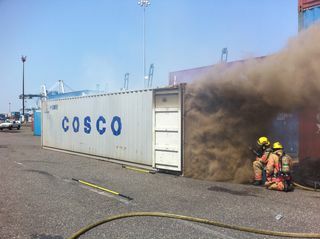 Although no people were harmed, nearly half of the containers were damaged from the fire. Still, this news might scare a few businesses that ship international cargo. Fire from a container could damage the cargo, but it could also damage the vessel, the environment and it could be harmful to the crew on the vessel. The good news is that container fires are usually rare in the transportation process. Sometime it might depend on the commodity that you are shipping and if it is hazardous. And while the causes of containers fires might be numerous, the best solution might be to get ocean cargo insurance. Your trusted freight forwarder can help you find insurance to purchase. There are different clauses in insurance that might help deal with the aftermath of a fire. One policy aspect might be a Free of Particular Average, English Conditions (FPEAC) clause, which helps with recovery of a partial loss if the vessel caught on fire. Perils of the Sea is another possible coverage that includes fire protection usually. There is also sometimes a Shore Clause, which covers fire accidents at sea or on land to your container. And sometimes, ocean cargo insurance covers damage from lightning, which can also cause a fire. Overall, it is sometimes best not to get too worried about a container fire, because again, they are usually rare.